It's been a while since I read a comic. So when I found myself in the comic aisle of my library, it felt a little bit like coming home. It also felt extremely exciting. I'd only ever gotten comics on hold, so being there in a whole aisle filled with them felt a bit like finding heaven or the holy grail. So it was that I ended up walking out with an armful of comic books, way more books than I had ever intended. (But isn't that the way it always goes?) I thought I had picked out all the comics I wanted, but as I was walking out of the aisle, one title snagged my eye. 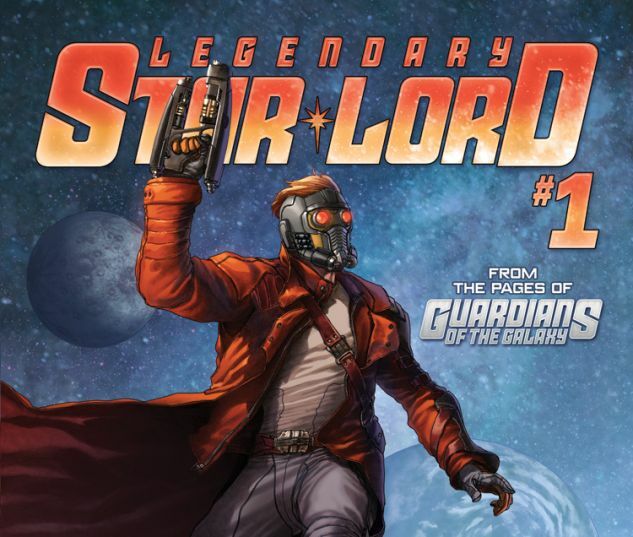 Legendary Star-Lord, Vol. 1: Face It, I Rule. This comic, written by Sam Humphries and illustrated by Paco Medina and Freddie Williams II, was appealing. Was it the word "Legendary" that caught my eye? Was it the iconic name "Star-Lord"? Was it the subtitle, "Face it, I rule"? Was it my extreme love for Peter Quill and his fellow guardians? Was it a unique, explosive combination of all four? Whatever it was, I immediately stopped, took a few steps backward, and picked this book up off the shelf. I did a cursory glance, then immediately added it to my (large and heavy) collection of books to take home. 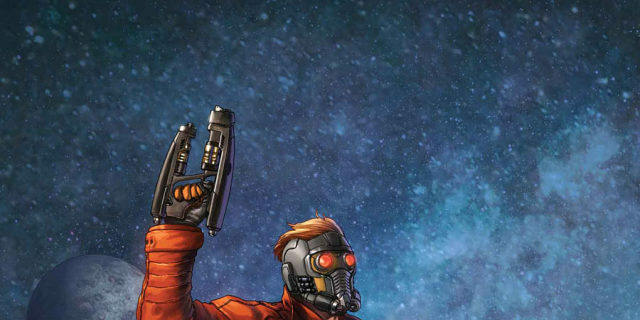 It's the Legendary Star-Lord. Of course I had to. Of course. When I arrived home, this comic was the first I picked up because I was just so excited to dig in. From the first page, I was drawn into Peter's story. I didn't really think it was possible for me to love him more, but this comic made that happen. While this Peter isn't completely identical to the Peter from the films, it's obvious that they're the same person, mirror images of each other. 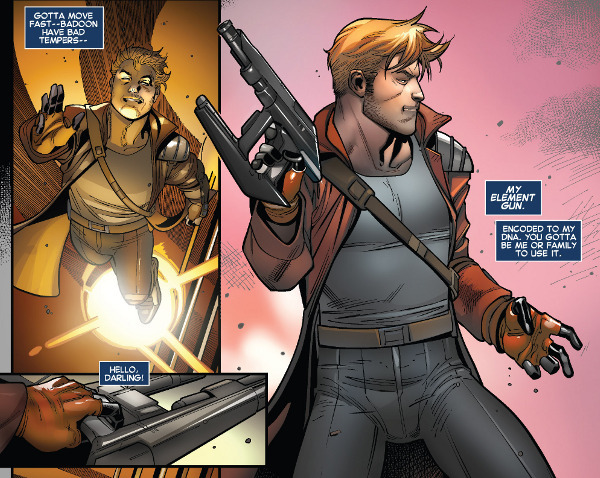 The first Legendary Star-Lord released in July 2014, and Guardians of the Galaxy was released a month later in August 2014, so the two Peters coexist and draw off of each other. It's clear from the design of the characters and some of the references the comics that the comic doesn't precede the movie; rather, it's almost a tie-in to the movie. The film version of Peter is a little less rough around the edges. The comic version is straightforward and brash, yet still a cinnamon roll at the core. 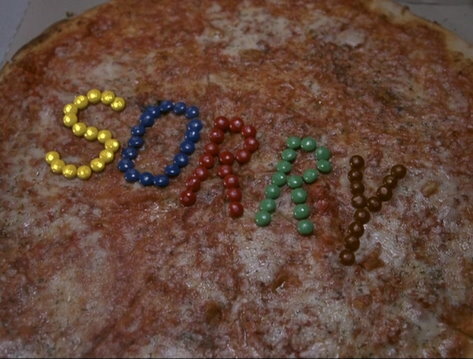 And of course, the film version of Peter is still the iconic a-hole we've come to know and love. The comic version just sharpens that aspect of him and brings it even more to the forefront, something I can't even complain about--I love it. In fact, I'm extremely glad I got to see this additional side of him. Both versions of Peter are hands-on and get things done, preferring to address a problem head on instead of dancing around it. We also get to see even more of how young Peter struggled in this comic, something that, of course, broke my heart. We get to see how this space boy became a space man and what influenced him along the way. If he's a little unrefined, you can't really blame him for it. When it comes down to it, Peter Quill is the same no matter where he is. The comic version of Peter only enriches the film version, and vice versa. Speaking of the film, the Guardians don't feature heavily into this comic, sadly--though they do make a few appearances here and there. This is mostly Peter's story, as evidenced by the title. However, this isn't only his story. 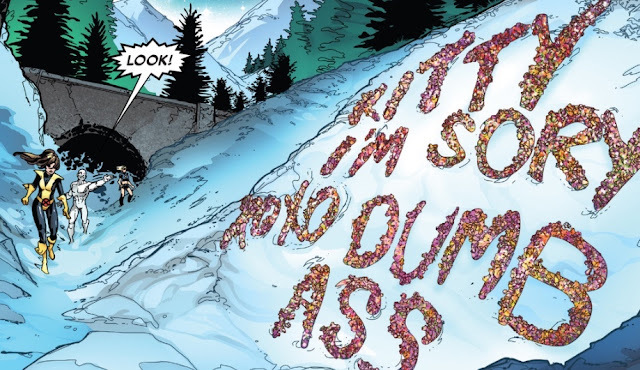 We get several exciting new characters, but there are also appearances by familiar faces--Kitty Pryde, for example, whom Peter has to write an apology to on the side of the mountain. One addition I was especially excited about was Peter's half-sister, Victoria of Spartax, related to him by his awful father. Though film fans will know Peter's father to be Ego, in the comics his father is the space emperor J'son, and trust me, they're very similar. Though it isn't easy, Peter and his half-sister get to know each other, and it's really kind of touching. Plus, she's a badass. Overall, the comic's arc is a bit messy, bringing in a bunch of different elements, characters, and people. Yet at the heart of it all, uniting all of the story lines and elements, there's Peter Quill. Ultimately, this comic is all about his escapades and (mis)adventures as he gets into all sorts of trouble, landing in jail several times and facing some of the galaxy's baddest supervillains (one of whom is currently one of the MCU's baddest supervillains...). Throughout it all, Peter and all his antics bring a sense of coherency to the storylines. Though the story was mostly setup and was a bit disjointed at times, I still really enjoyed this comic. The colors were fun, the artwork bold, and the dialogue golden. It made me laugh out loud several times, something that often doesn't happen when I'm reading. 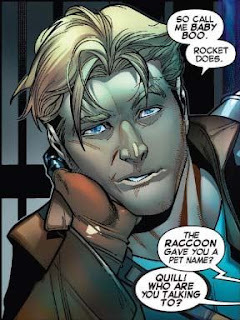 I also loved the way Peter was drawn--handsome and debonair, this outlaw is definitely one you'll want to keep your eye on, for more reasons than one. 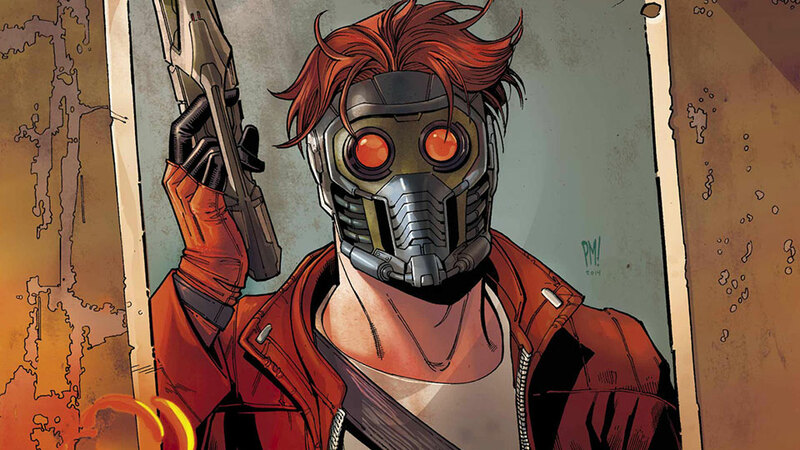 While usually comics seem like different, enlightening versions of the Marvel Cinematic Universe, this simply seemed like an extension of Peter Quill and the Guardians that I know and love. As someone who walked out of the theater after Guardians of the Galaxy Vol. 2 immediately clamoring for more, this comic was like a gift sent from the heavens. You can bet I'll be back for more. While I'm not as much of a comic newbie as I once was, I think I'm still fairly new to the world of ink-and-paper-superheroes. 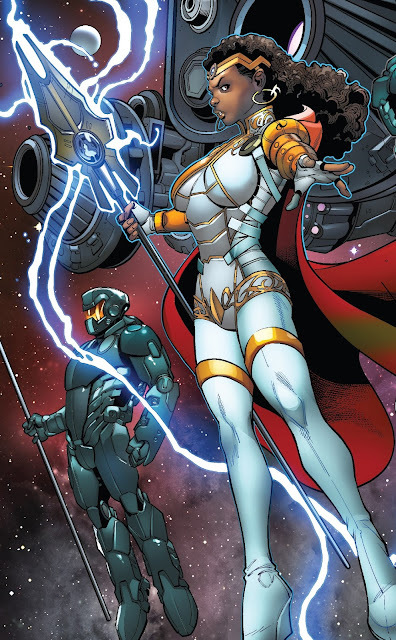 That being said, if you're new to comics, I think this is a fantastic entry point because of its similarities to the Guardians of the Galaxy films. However, this comic has so much to offer for everyone. 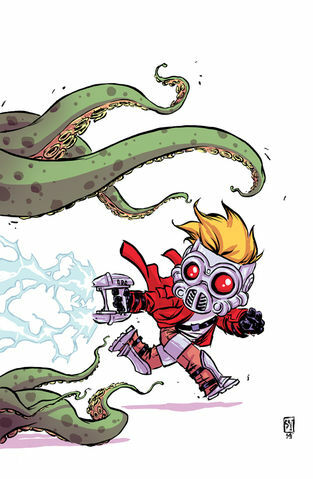 If you're looking for a fun, lighthearted comic with the atmosphere and fun of the Guardians movies--or if you love Peter Quill even just a little bit--definitely pick up Legendary Star-Lord Vol. 1. It's legendary. And it rules. Have you read this one? What comic should I read next?